Congratulations to all of our Club Championship teams! Congratulations to Team K. Pallett for winning the 2019 Saville Community Centre Ladies Club Championships. 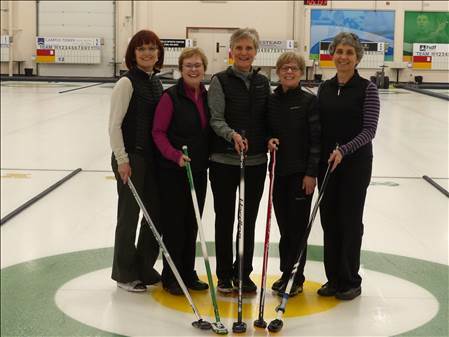 Karen Pallett and her team of MaryLynne Gould, Myrna Jones, Donna MacNeil and Anita Jocksch from the Wednesday Senior's League. Team K. Pallett recently competed in Leduc at the Curling Club Championship playdowns where they represented the Saville extremely well, losing in a B qualifier semi-final. Team K. Pallett also represented the Saville Centre at the Tournament of Champions (Cities) at the Thistle Curling Club from April 6th-11th. We are proud to be represented by such a fantastic team! Congratulations to Team Redel for winning the 2019 Saville Community Sports Centre Men’s Club Championships. Skip Gord Redel, Third Kevin Hawkshaw, Second Kalem Hamilton, Lead Luke Toley, and Alternate Joseph Trieu went undefeated throughout the Club Championship playdowns before defeating Team Homeniuk in the final. Team Redel went on to the Curling Club Championship Playdowns in Leduc from March 22nd - 24th where they represented the Saville Centre extremely well. Congratulations! Congratulations to Team McNish for winning the 2019 Saville Community Sports Centre Mixed Club Championships. Doug McNish and his team of Krysta Hilker, Mike Lambert, and Corrine McNish of the Thursday Night Mixed League qualified through the B side and defeated Team Richard in the final. Congratulations Team McNish! As well, a HUGE congratulations to Team McNish as they won the tournament of Champions from April 6th to 11th and are CITY CHAMPIONS! An incredible accomplishment and we are very proud of this great team! Congratulations to Team Sutton for winning the 2019 Saville Community Sports Centre Seniors Club Championship. Don Sutton and his team of Gerry Wilson, Peter Adamski, Mike Allen, and Ken Arndt qualified through the B side before defeating Team Towle in the final. Congratulations to Team Sutton on being Saville's 2019 Seniors Club Champions!